Management direction statements (MDS) provide strategic management direction for protected areas that do not have an approved management plan. Management direction statements also describe protected area values, management issues and concerns; a management strategy focused on immediate priority objectives and strategies; and, direction from other planning processes. While strategies may be identified in the MDS, the completion of all these strategies is dependent on funding and funding procedures. All development associated with these strategies is subject to the Parks and Protected Areas Branch’s Impact Assessment Policy. The objective of the ecological reserve program in British Columbia is the conservation of representative and special natural ecosystems, plants and animal species, features and phenomena. Ecological reserves contribute to the maintenance of biological diversity and the protection of genetic materials. They also offer opportunities for scientific research and educational activities. In most ecological reserves, non-consumptive low-intensity uses such as nature appreciation, wildlife viewing, bird watching and photography are allowed. The provincial government established Blue/Dease Rivers Ecological Reserve (E.R. #58) as an ecological reserve on February 6, 1975, by Order-in-Council #441/75 under the Ecological Reserve Act. The Protected Areas of British Columbia Act provided legislated status to the ecological reserve boundaries on June 29, 2000. The ecological reserve covers 777 hectares in the Liard Plains Ecosection and in the Boreal White and Black Spruce (BWBS) Biogeoclimatic Zone. The Kaska Tribal Council, Laird First Nation and the Ross River Dena Council identified Blue/Dease Rivers Ecological Reserve as being within their asserted traditional territory. Ecological reserve designation does not affect in any way existing aboriginal and treaty rights of First Nations peoples guaranteed under Section 35 of the Canadian constitution. The provincial government established Blue/Dease Rivers Ecological Reserve to protect a representative portion of the Boreal White and Black Spruce biogeoclimatic zone containing a variety of plant communities. The ecological reserve contains a number of glacial features including eskers, drumlins and morainal landforms. The ecological reserve also includes such physical features as two small lakes and several wetlands. The small lakes likely contain fish species found in the general Blue River watershed including arctic grayling, lake trout and rainbow trout. These features provide a variety of habitat types with different moisture conditions from wetlands to dry gravely ridges. landscape and provides backcountry recreation opportunities. Chickens Neck Ecological Reserve lies about 97 kilometres south of Blue/Dease River and protects an excellent stand of mature spruce – subalpine fir forest. A fire management plan from 1997 indicates that all fires in the ecological reserve will receive initial attack. The ecological reserve’s flora, fauna, and important habitats, especially species-at-risk, and rare plant species and plant communities may be at risk because of the lack of inventories and mapping. Damage to the ecological reserve is occurring because the Ace One Fire Lookout Road allows access to the ecological reserve where people pursue incompatible outdoor recreation activities such as camping and hunting. The road through the ecological reserve may contravene section 1 of the Ecological Reserve Act regulations. The “initial attack” policy advocated in the 1997 fire management plan may be inappropriate because of the ecological reserve’s forest context and the goal of letting natural processes unfold without human interference. Monitoring of the ecological reserve is lacking because the ecological reserve has no volunteer warden. • Archaeological and historic values may be at risk because the recent First Nations traditional use studies have not been reviewed by Environmental Stewardship Division. Complete an inventory of the ecological reserve’s flora and fauna.  Priority must be given to species-at-risk, and rare plant species and plantcommunities . Review the status of the Ace One Fire Lookout Road within the ecologicalreserve to determine its legality under the Ecological Reserve Act. Provide signage to notify visitors of the ecological reserve boundaries. Recruit an ecological reserve warden for the ecological reserve to conductyearly monitoring visits and provide site reports. Reassess the 1997 fire management plan to determine whether “initial attack”is the desired policy for this ecological reserve. Investigate and collect information on cultural heritage values in cooperation with First Nations. Work with the Kaska Tribal Council to protect cultural heritage values. • Work cooperatively with the First Nations to build positive working relationships, and to assist in the protection of cultural heritage values and good ecological reserve management. Nations’ traditional use studies for this area. • Continue to maintain the Ministry of Water, Land and Air Protection web site to provide current and accurate information about this ecological reserve. Environmental Stewardship Division will continue to consult with all interested First Nations and other stakeholders regarding management of this ecological reserve. This ecological reserve is considered of low priority for the development of a management plan with full public involvement. This management direction statement will be reviewed and revised, if necessary, in five to seven years. Protects a representative example of the BWBSdk2 (Boreal White and Black Spruce zone, Dry Cool subzone, Liard variant) Biogeoclimatic Zone. This ecosystem unit is currently underrepresented (4.2%) in the protected areas system. Blue/Dease Rivers Ecological Reserve’s contribution is minimal, accounting for only 1.5% of the overall representation of this ecosystem unit. The ecological reserve contains a wide variety of habitat and vegetation types in a complex vegetation mosaic including dry and wet forests, fens, bogs, and marshes. 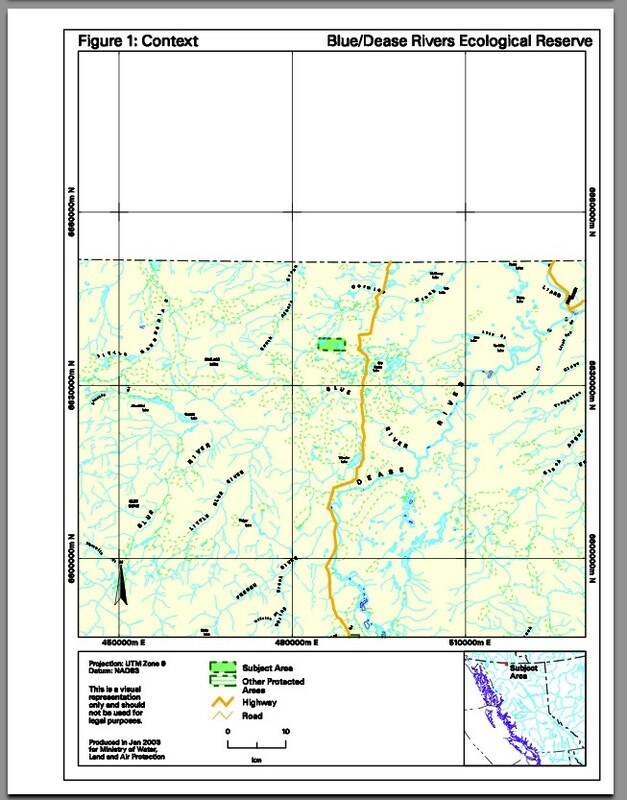 This ecological reserve is one of six small protected areas within the Liard Plains Ecosection, and contains 11.3% of the total protected area in this poorly represented ecosection (0.63%), and 12.7% of the protected area in the BWBSdk2 in the Liard Plains Ecosection. Provides opportunities for scientific research into a variety of forest and vegetation types within the BWBSdk2 in an undisturbed setting. • Due to the sensitive nature of the ecological reserve, human use activities, except for research and limited education, should be discouraged. There are no opportunities for commercial use. The Archaeological Inventory Data Centre has no records of archaeological sites within the boundaries of the ecological reserve. Provides representation in the protected area system of underrepresented ecosection. Conserves a variety of glacial features including eskers, drumlins and moraine landforms. Access to Blue/Dease Rivers Ecological Reserve is via a 2.5 kilometre long dirt road from Highway 37, 12.5 kilometres south of the Yukon border. This road is not maintained and may be unsuitable for two wheel drive vehicles, especially during wet periods. The Ministry of Forests constructed this road in 1961 to provide access the Ace One fire lookout. • The adjacent lands are mostly used for hunting, trapping and recreational activities; little industrial land use occurs in the area. Lies within the asserted traditional territory of the Kaska Tribal Council, Laird First Nation and the Ross River Dena Council. Ministry of Sustainable Resource Management (British Columbia Conservation Data Centre (CDC)) has an interest in rare species and species at risk in the ecological reserve. Ministry of Water, Land and Air Protection, Skeena Region Fish and Wildlife Section has an interest in wildlife species that inhabit the ecological reserve. 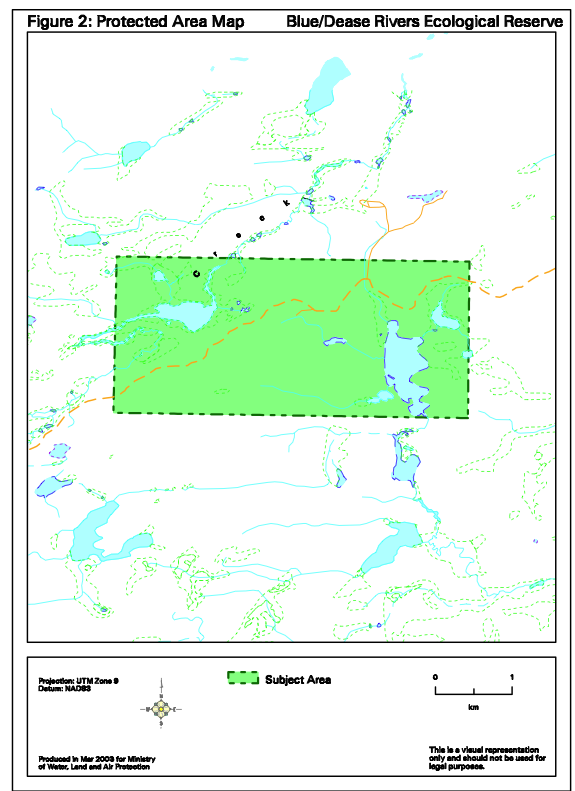 Regional residents and residents of Dease Lake, Good Hope Lake and Watson Lake are interested in the ecological reserve because of its conservation of ecological values. Federation of British Columbia Naturalists have an interest in this ecological reserve because of its conservation intent and protection of ecological values. Scientific and educational research institutions have an interest in this ecological reserve because of its protection of benchmark wetland environments and glacial deposition features. Friends of Ecological Reserves have an interest in this ecological reserve because of its protection of benchmark wetland environments and glacial deposition features.Role of Blue/Dease Rivers Ecological ReserveThe primary role of Blue/Dease Rivers Ecological Reserve is to conserve a representative portion of the Boreal White and Black Spruce Biogeoclimatic Zone. The ecological reserve also serves secondary research and education roles by providing opportunities to study and learn about an undisturbed mosaic of forest and vegetation types in the Boreal White and Black Spruce Biogeoclimatic Zone. Appendix 1. Blue/Dease Rivers Ecological Reserve Table of Acceptable Activities, Uses and Facilities.